I am a jacket collector. I have tweed, leather, suede, wool, twill, fur… you name it, I’ve got it. The one style my closet has been lacking is a military-style jacket! I’m such a big fan of this look – the regimental rows of buttons, the fancy epaulets, and structured silhouette give me all the fashion feels. With this type of jacket though, it’s gotta be juuuust right. So many times I’ve tried on similar jackets by other designers and the fit just wasn’t there, or the look was too masculine for my taste. Leave it to my favorite British brand Burberry to create the perfect balance of masculine and feminine in a military jacket, and also have it fit like a dream. The devil is in the details: with a subtle peplum, a tailored waist and shiny gold buttons in all the right places, this jacket makes a statement while complimenting the classic feel of the iconic Burberry brand. This reversible poncho/cape would make a luxurious travel companion! The camel style would look fab with all of the black in my closet. For an all-weather layering option, try this quilted vest. It’s pretty lightweight, so it won’t bulk you up or take up too much space when you’re traveling! The belt bag is Burberry’s standout handbag design for fall, and I love it! The bag’s small size balances out the chunky chain and oversized belt buckle effortlessly. Such a fun look! This long-sleeve knit dress features dainty button details and a modest hem for the fall/winter season. A style that would look great for all ages! Don’t forget my favorite rain boots from last fall – they got restocked this season, so don’t miss ’em! Adore the equestrian vibe. This trench cape is so chic and timeless. I definitely wouldn’t mind adding it to my wardrobe. This jacket is a dream, love it! SO chic! I am obsessed with this look on you, lady! Perfect transitional look with those classic sandals! So chic! 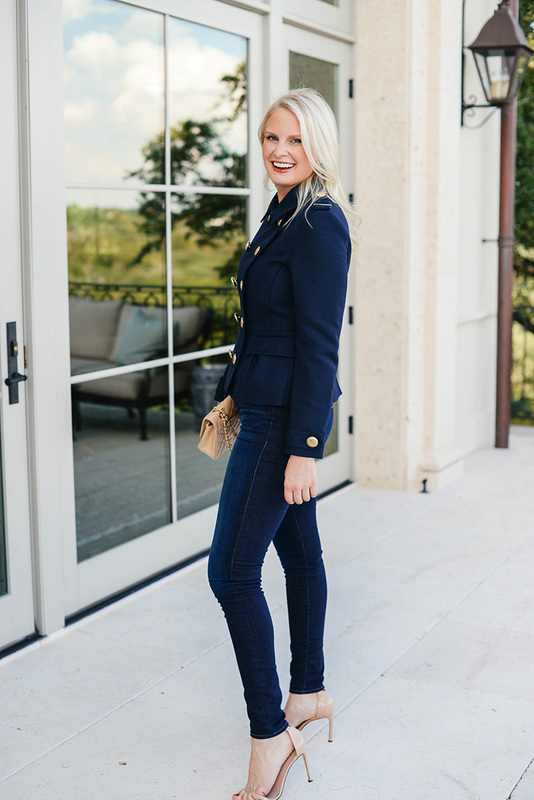 Love the all navy look!! I am obsessing over your military jacket! So cute! That jacket is adorable! So chic! This jacket is dreamy! 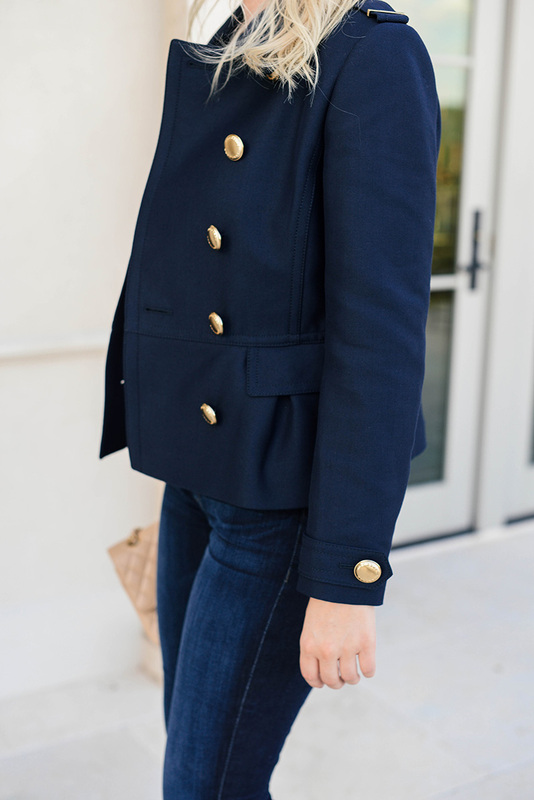 The color is the most perfect shade of navy and I love the details! Saw this on your IG last night and just loved it! The jacket is just so chic! 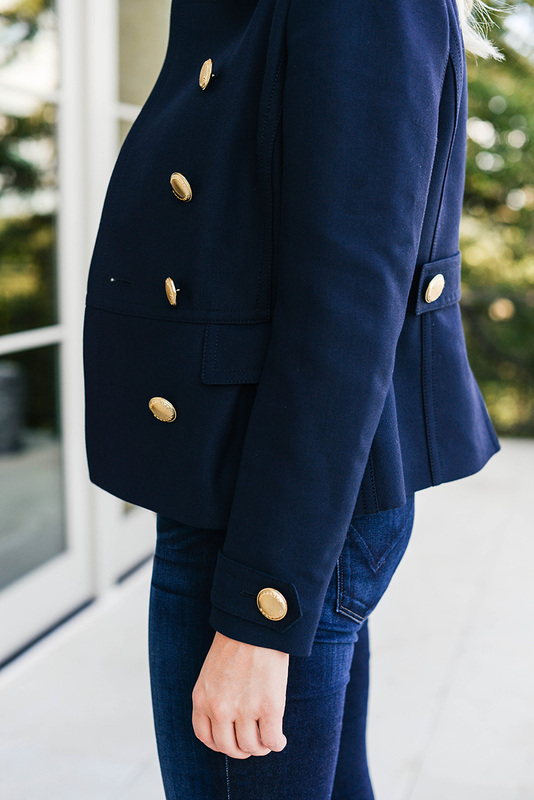 Such a classic jacket and those gold buttons are absolutely stunning!! Girl this looks great on you!! I love this jacket. So Napoleon-ish! I LOVE that jacket! I cannot get enough of it! such a beautiful jacket! Love this look and the fact that it will be a favorite forever. That jacket is perfection on you! Love that jacket, Merritt! Looks great on you. I’ve been eyeing the green version. I am beyond obsessed with this jacket! Seriously chic. Very nice outfit! The jacket is really great! This jacket is perfection! That little ruffle on the bottom is just perfect. Love, love, love.